The Mekong River basin has long been an irreplaceable source of water and fish for the villages along its banks. In recent years, though, demands for industrialization and growth have put new pressures on the Mekong and its habitats. Several countries, including Laos, Thailand and China, have constructed hydroelectric dams on the Mekong River to satisfy their growing needs in energy. While these developments are necessary from an economic standpoint, they can be very detrimental to Mekong’s vital ecosystems. For example, the vitality and very existence of Tonle Sap, a river and lake system in Cambodia, depends heavily on annual flooding of the Mekong during the monsoon season. 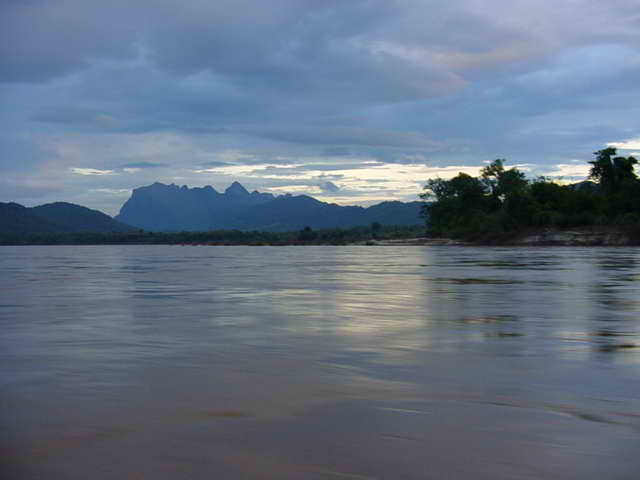 Existence of dams, combined with other detrimental human interference like deforestation and pollution, however, causes the Mekong water level to drop, making flooding less viable. Greater development along the Mekong may eventually lead to complete cessation of the Tonle Sap flooding. The Mekong River has long played a vital role in the livelihoods of people who live on its banks. It originates in Tibet, then flows through Myanmar (Burma), Laos, Thailand, Cambodia and Vietnam, before finally discharging into the South China Sea. Because its exact source cannot be determined, due to existence of several tributaries in inaccessible environments, Mekong’s true length is uncertain, but it’s estimated at more than 4,800 km, with total area of drainage basin at around 810,000 sq km . Mekong’s potential has been traditionally utilized both as a source of water and of sustenance, but in recent years it has become increasingly important for economic growth of countries it irrigates. A series of major development projects have been completed on the Mekong, and many more are underway. For the most part, governments construct hydroelectric dams on the river to supplement their other sources of electricity generation. China, which gained notoriety for the colossal and environmentally detrimental Three Gorges Dam project, is also engaged in an extensive program of dam-building on the river: it has already completed two, at Manwan (in 1993) and at Dachaoshan (in 2003), while at least another four are under consideration . Dams inevitably affect the flow of the rivers, especially during the filling stage, and such was the case with the Mekong, when its water level dropped dramatically following the completion of the Manwan dam. But China’s upstream position on the Mekong makes the effects of damming much more significant. Because China’s dams are upstream, when they affect the seasonal fluctuations in water volume, the downstream countries feel the effect of reduced flows and fish stocks most acutely. It is feared that in addition to reducing the river volumes, the dams will prevent nutrient-rich sediment from flowing, which would cause serious harm to agriculture and fishing downstream. Among the areas in greatest danger is the Tonle Sap river-and-lake system in Cambodia, which is the largest freshwater lake in South East Asia. Because this area is home to more than 400 species of fish, as well as many species of mammals and reptiles, it is a veritable hotspot of biodiversity that was designated as a UNESCO biosphere in 1997 . Through a unique natural process, the Tonle Sap, which is fairly small and shallow for the most of the year, increases in size and volume almost nine-fold during the monsoon season when the Mekong floods and pushes water into the lake. Due to its rich biodiversity, the Tonle Sap floodplain is one of the most productive inland fisheries in the world, supporting over 3 million people and providing at least 60% of the Cambodians’ protein intake . The problem is further complicated by the overall decline of the Mekong River, caused by adverse human interference and climate change. While exact origins of the Mekong have not been identified, it is known that its source lies somewhere in the mountains of Tibet. Every spring, when the ice melts the resulting water flows into the river, replenishing it. With Asia becoming hotter and drier as a consequence of climate change, the glaciers that provide Mekong’s water may diminish with time, supplying less and less water with each consequent year. Such decline in water supply at the source, exacerbated by excessive demands imposed on the Mekong’s flow by filling of dam basins, may lead to severe deterioration of the Tonle Sap and its biosphere. All countries on the Mekong River watershed, with the notable exceptions of China and Myanmar (Burma), belong to the Mekong River Commission (MRC). Founded in 1995 with the signing of the Agreement of the Cooperation for the Sustainable Development of the Mekong River Basin, the organization seeks to ensure “reasonable and equitable” use of international waters and the concept of “sovereign equality” when it comes to development on the river and use of its waters . In developing upper Mekong for navigation and hydropower projects – the Upper Mekong Navigation Improvement Project (UMNP) and the planned cascade of eight dams in Yunnan – China has acted unilaterally and without consultation with downstream nations. Beijing maintains that China is within its sovereign rights to do what it wants on its portion of the river, and, not being a member of the MRC, China is under no obligation to notify or consult with downstream countries or “to share data on its plans or on its operation of existing dams” . To emphasize this point, China has steadfastly insisted on calling its section of the river Lancang-Jiang (the Chinese name of the Mekong), stressing the fact that the dams are being constructed on a Chinese river and decisions about its use are subject only to Chinese sovereign interests. 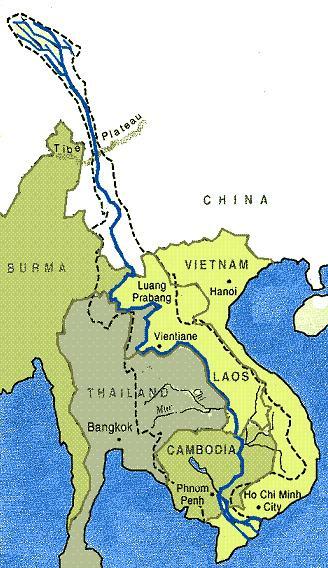 China’s work on the Mekong gained legal status in 2000 with the signing of an Agreement on Commercial Navigation on Lancang-Mekong River by China, Burma, Thailand and Laos . However, many other countries affected, like Cambodia, were not party to this agreement. Furthermore, the economically and strategically weaker downstream nations have been reluctant to bring criticism against the Chinese Mekong dam cascade for the fear of jeopardizing their economic ties with China: Laos has its own dam-building projects; Thailand plans to buy some of the electricity generated by the Chinese dams; and Cambodia is China’s largest aid recipient . The United Nations’ 1997 Convention on the Law of the Non-Navigational Uses of International Watercourses requires nations sharing a waterway to “coordinate development and lessen the effect on downstream communities” . But, here too, China’s downstream neighbors are unlikely to seek legal recourse, largely due to their reliance on China’s economic assistance. Location: Mekong River basin, covering China’s Yunnan province, Myanmar (Burma), Thailand, Laos, Cambodia and Vietnam. While China and Cambodia are primary actors, the transboundary nature of the river’s flow does not preclude other countries of the Mekong basin from becoming involved. Dams generate hydroelectricity and create irrigation reserves for agricultural production by sequestering water in reservoirs, which is then directed into irrigation system or used to power electricity-generating turbines. However, the filling of any reservoir with water requires extended diversions of river flows into the reservoir, diminishing the flows that reach downstream areas, and, in cases of big or multiple dams, can irreversibly change the ecosystem and water table downstream. As the case of the Laotian dam on the Mekong has already demonstrated, the reduced water flow in the river can also cause an intrusion of saline water, which can greatly harm the farmland and forests, killing vegetation and making agriculture impossible. 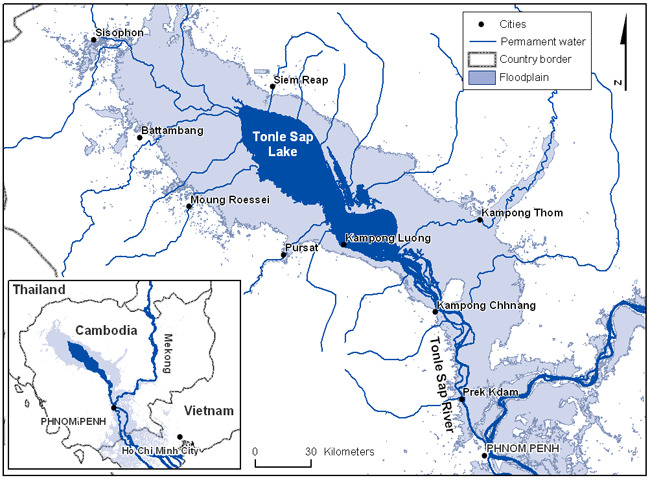 More importantly, the drop in water levels and increased salinization can lead to decline in fish populations in the Tonle Sap fishery—an event that threatens dire consequences for Cambodia, since Tonle Sap fish are the main protein source for Cambodia’s population, and up to 60 million people in the basin  . Because dams alter the natural environment by changing access to, quantity and quality of water, the number of species affected (from humans to fish) is innumerable. In 2003, a team of researchers from the Finnish Environment Institute concluded that China’s Manwan dam cut the amount of sediment in the water at Chiang Saen, Thailand by one-half. The researchers further established that China’s network of dams would likely lead to “lower water levels in the river, less flooding of the Tonle Sap, less transfer of nutrient-rich sediment–and a degraded fishery” . Like in most of Southeast Asia, Cambodia’s climate is dominated by monsoons. As a consequence, Cambodia has roughly two seasons—wet and dry—which occur because of the distinct difference between periods of heavy rainfall and flows of drier, cooler air, respectively. China Cambodia (Tonle Sap) China builds a new dam on the Mekong, filling of which results in catastrophic drop in the water level, rendering inundation of Tonle Sap impossible, which in turn prevents fish spawning and decimates fish populations. Although no bullet has been fired up to now over the Mekong River damming and Tonle Sap depletion, any conflict, if it occurs, is bound to be between unequally matched partners. Consider a situation where Cambodia will plead its case before China, the region’s economic and military leviathan. Furthermore, it is essential to recognize that the consequences of any clash will be disastrous both for the region’s fragile ecosystem and its burgeoning economic development. The established mechanism through which flooding of the Tonle Sap occurs is a natural process. Water run-offs from melting icecaps in Tibet replenish water in the Mekong, which in turn provides water for the flooding of the Tonle Sap in monsoon season. However, natural and man-made intrusions (climate change and Chinese dams on the upper Mekong) disrupt these natural processes, and have an adverse effect on the Tonle Sap. Thus, because Asia becomes hotter and drier as a consequence of global climate change, icecaps will grow smaller year after year, and there will be less water released when these smaller icecaps melt. Since less water will be supplied into Mekong, less will be available for flooding of the Tonle Sap. As was described in Section 6, Tonle Sap is an irreplaceable resource for breeding fish stocks and therefore, if Tonle Sap no longer floods, fish stocks will not grow, and Cambodians’ protein intake will decline. Similarly, because filling of dam basins required tremendous amounts of water, building of Chinese dams on the upper Mekong may also serve to decrease the Mekong water level, leading to cessation of Tonle Sap flooding and decline in fish population. The spatial scope could be considered both bilateral and regional. This dispute is bilateral since it affects economies and environment of China and Cambodia, which are two parties directly involved. At the same time, the damming of the Mekong River is a regional issue, which has a possibility of rapidly escalating into an international crisis if not addressed properly. While China and Cambodia are the primary actors, this issue essentially concerns any nation in the Mekong River watershed, and, by extension, any other countries that border them, if the situation grows volatile. The accesses to water, fish stocks and potential for harvesting of hydroelectric power are all crucial points of this case. It is important to keep in mind that China is not the only country upstream that builds dams on the Mekong, and Cambodia is not the only downstream one that stands to loose because of disruptions in the river’s flows. While geographic and cultural proximity and longstanding interactions between the countries will help in the mediation process, these states are not so interconnected that they cannot risk open conflict. To date, no conflict has occurred between the actors involved. This issue has the potential of being resolved peacefully (either through mutually beneficial negotiation or as a consequence of China, which is economically and militarily stronger, imposing its will on its less powerful downstream neighbors), and it is not yet possible to predict the outcome. The utility of building a hydroelectric dam Thailand in 1970s, is weighted against the construction’s major environmental consequences of deforestation, wildlife destruction, water scarcity, and population displacement. Access to the Nile's waters has already been defined as a vital national priority by many countries in the Nile basin, and some have stated their willingness to got to war over it. The case considers the destabilizing effects of struggle over water on peace and economic development in the region. The relationship between environmental resources and conflict is examined using the ongoing dispute between Israel and Jordan over water supply of the Jordan river as example. The case looks at the struggles between Israel and Lebanon, although not always armed, for the waters of the Litani River. Water is scarce in the Middle East, and therefore, ownership of this valuable resource is a hotly contested topic. Although presently there is not an armed struggle over Litani, there is a history of armed clashes (in the 1967 war, and in 1982) and it is conceivable that in the future the struggles over it may become armed. The case seeks to evaluate the conflict over water in the Tigris and Euphrates rivers through evaluation of the situation created by the construction of the Southeastern Anatolia Development Project (GAP) by Turkey, and the reactions of Syria, Iran and Iraq, which are other riparian parties in the rivers’ basin. The case looks at the environmental and security threats posed to South Korea by the construction of a gigantic dam by North Korea in the Geumgang Mountain. As the field values and weighting indicate, access to water was deemed as the most important variable, while regional aspects were relegated secondary importance, since conflicts over water are, unfortunately, not particular to any one region of the world, but rather are common wherever two or more sovereign powers cannot agree on sharing this resource. While none of these cases relate directly to Tonle Sap (and only one to the Mekong river), the overall results are extremely useful for drawing conclusions about how a conflict over water may evolve, regardless of geography or economic situation of the parties involved. The first conclusion is that conflicts are not only possible, they have happened, and therefore, preventive measures must be taken to ensure that animosity between two states over sharing a common water source does to transform into a military clash. The second conclusion is that access to rivers as a source of water for drinking and irrigation is not the sole cause of conflict. Other issues, like sovereign rights and environmental vs. economic needs are extremely relevant. The third conclusion is that sovereign parties can avert armed conflict through negotiation, which can be a happy example for any future disagreements over access to a common water source. Zhou Changjin and Guan Zhihua. “Reconfirmation on Identification of True Source and Headwater of Lancang Jiang (Mekong River)”, Institute of Geographic Sciences and Natural Resources Research, Chinese Academy of Sciences, Geographical Research, May 2001, Vol. 20, No. 2. Pearce, Fred. “Chinese dams blamed for Mekong’s bizarre flow.” NewScientist.com, Mar. 25, 2004. "Tonle Sap." UNESCO – MAB Biosphere Reserves Directory. Bonheur, N. and Benjamin Downs Lane. “Biodiversity Conservation and Social Justice in the Tonle Sap Watershed: The Tonle Sap Biosphere Reserve,” presented at the International Conference on Biodiversity and Society, Columbia University Earth Institute, UNESCO, May 22-25, 2001. For more information, see Mekong River Commission. Hirsch, Philip, Kurt Mørck Jensen et al. “Attachment 1: Case Studies”. National Interests and Transboundary Water Governance in the Mekong. Australian Mekong Resource Center, 2006 (pp. 12-16). Goodman, Peter S. “Manipulating the Mekong”. Washington Post (Dec. 30, 2004): Page E01. Note on image sources: All images obtained from the Wikimedia Commons, a project of the Wikimedia Foundation. Permission is granted to copy, distribute and/or modify this document under the terms of the GNU Free Documentation License, Version 1.2 or any later version published by the Free Software Foundation. Click image to link to its source. The causal diagram was created by the author, all rights reserved. Goh, Evelyn. “China in the Mekong River Basin: the regional security implications of resource development on the Lancang Jiang.” Singapore: Institute of Defense and Strategic Studies, 2004. “Mekong.” Wikipedia, The Free Encyclopedia. 25 Jan 2007. Wikimedia Foundation, Inc.
Milton Osborne. The Mekong, Turbulent Past, Uncertain Future. New York: Atlantic Monthly Press, 2000. Woods, Kevin. “Transboundary Environmental Governance in the Mekong River Basin: Civil Society Spaces for Transboundary Participation” Presented at “Politics of the Commons: Articulating Development and Strengthening Local Practices”, Chiang Mai, Thailand, July 2003. < >. van Zalinge, Nicolaas, Thuok, Nao, and Touch Seang Tana. “Where There is Water, There is Fish? Fisheries Issues in the Lower Mekong Basin from a Cambodian Perspective.” Presented at “Crossing Boundaries”, the seventh annual conference of the International Association for the Study of Common Property, Vancouver, British Columbia, Canada, June 1998. Vannaara, Tek. “Sustainable Livelihoods of Local People in Community Fisheries, The Upper Mekong River Cambodia, Stung Treng Province: A Case Study ‘Au Svay Commune Community Fisheries’, Talaborivat District, Stung Treng Province.” Presented at “Politics of the Commons: Articulating Development and Strengthening Local Practices”, Chiang Mai, Thailand, July 2003.